The Sebago Card is a Gift Card and a Loyalty Bonus Card all in one. Purchase as a gift for friends, family, or employees. Gift cards can be recharged at any one of our brewpubs. And you can check your balance at any time through our website. Want to Add Sebago Swag? Check out the online store for clothes, glassware and more. You can earn credit each time you make purchases at our Brewpubs. 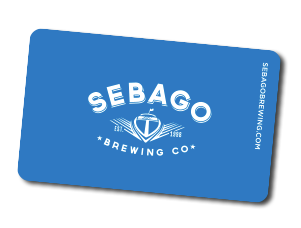 For every $150 spent on any purchases at a Sebago Brewpub earn $5 on your Sebago Card. Daily maximum of $150/$5 credit. Buy ten entrees Monday through Friday from 11:00am-3:00pm and receive your eleventh one free, up to $12.00 value. The value of your eleventh entrée will be taken off your bill automatically. Only one loyalty card can be credited for each check. Limit one entrée per day per card. You need to have the last name associated with your Sebago Card in order to check your balance. If you received a Sebago Card as a gift, you'll need to find out the last name the card was registered with when purchased. Please stop in to any one of our four Brewpubs to add value. To accumulate credits towards a reward, the member must present their card with every purchase. Rewards will be issued according to the currently active plans. Only the member paying the bill will receive credit towards bonus plan. There is a limit to how much credit can be earned each day. You can check your card balance and bonus plan balance by having your card swiped at any Sebago Brewing Company restaurant. Rewards will not be issued until your next visit. Sign up for the loyalty program by activating your card with your first purchase. It can only be activated with a purchase at any Sebago Brewing Company restaurant. When the card is activated you will be presented a voucher to fill out with relevant information in order to create a membership. You are responsible for the use and safety of your card and are liable for all transactions. We reserve the right to cancel membership and void member’s credits and rewards if there is any unauthorized use by the member. In the event of a lost or stolen card we can deactivate the original card and issue a new card to the original member. The original member will be required to show proof of identity in order to obtain a new card. All previous bonus information will attach to the new card. We reserve the right to create new bonus plans, change existing plans and discontinue this program at any time, with or without notice.